dianax has been nominated the # 1 Start-up at BigBooster International Start-Up Acceleration Program in Lyon this week. 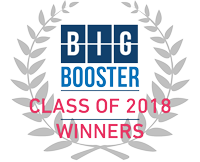 (www.bigbooster.org ). Out of the 250 startups participating from Europe, Middle East and Africa, dianax ranked among the best 44 back in November 2017. This week, for the final round of the contest, and after pitching in front of both a professional jury and a citizen jury, dianax has been nominated as the winner of the contest and absolute best 2018 start-up in the three categories (Global Impact, Informative Tech and Bio&Health). “We see this prestigious award as recognition of our value proposition and innovative technology in healthcare” commented Pascal Pouligny, Chief Marketing Officer. “It is a great reward for all our efforts and all of us at dianax take great pride of it.” As winner, dianax won the right to participate to the next fundraising events in Boston (early June), Shenzen/Shangai and Casablanca to pitch in front of US, Chinese and Middle East Investors.